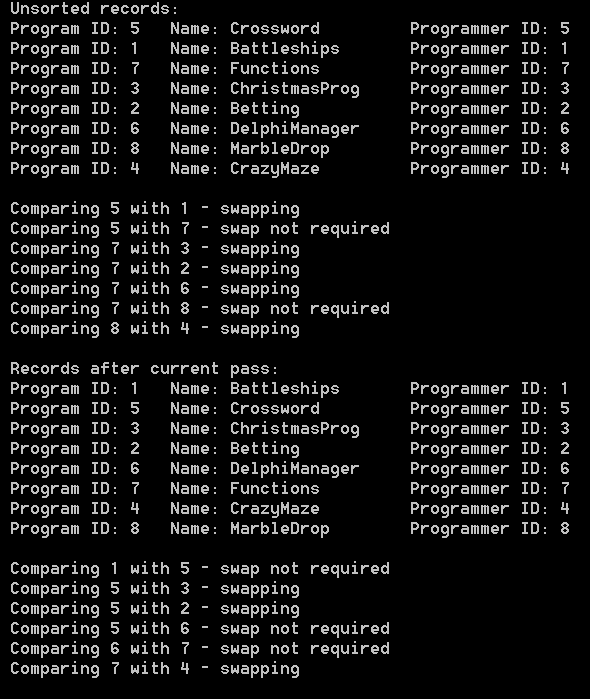 To perform a bubble sort on an linked list of records, we must repeatedly compare adjacent pairs of record IDs and swap the order of the records if necessary. The following diagram illustrates how three pointers must change after a swap. We denote a record by appending a caret to its pointer in the same way that it is used in Pascal code. PtrCurrent^.Next must contain the pointer that was PtrSucc^.Next. PtrSucc^.Next must contain the pointer that was PtrPred^.Next. PtrPred^.Next must contain the pointer that was PtrCurrent^.Next. We must use a temporary variable to make this group of assignments correctly. (The first record has no PtrPred^ record but if swapped, PtrFirst must be changed). 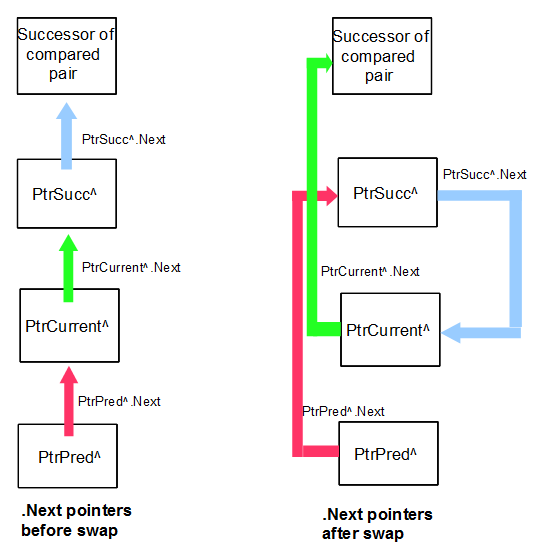 The new PtrPred^ is the old PtrSucc^ and its next pointer already points to PtrCurrent^. The new PtrPred^ will be the old PtrCurrent^. The first pass in a bubble sort is guaranteed to end with the last list item in its correct position. After the next pass, the penultimate item is in its correct position, and so on. The pointer PtrEnd changes after each pass so that we do not make unnecessary comparisons. The output for the supplied file Progs.txt is shown below. (This program uses the same test file as program LinkedListDemo).